Another success for Triumph and the GLS team. The material palette of black painted brick, rough sawn timber, raw concrete and a feature woodland environment the stand was a perfect setting to house the iconic triumph collection of latest motorcycles from the Adventure, Classic and Roadster ranges, as well as a display of Triumph custom bikes, clothing and accessories. 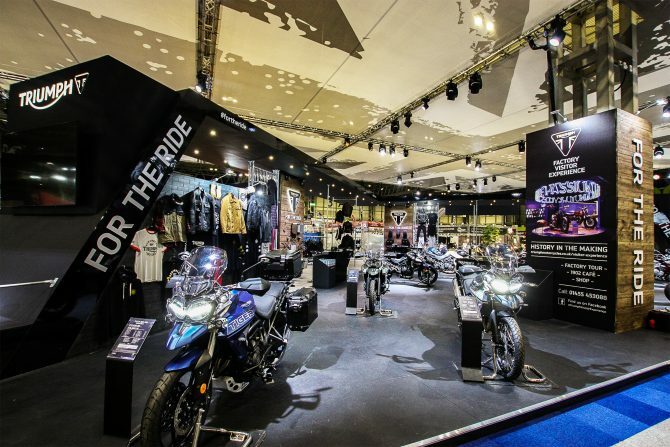 The annual Motorcycle Live event is the UK’s largest Motorcycle show, with an array of live and interactive entertainment, merchandising stalls, motorcycle manufacturers and special appearances from motorcycling celebrities.